The Chariot card is all about pulling all of your resources together to overcome the obstacles that are standing in your way. It’s about “taking charge” of your life — your goals, your decisions and your destiny — rather than just going along for the ride. 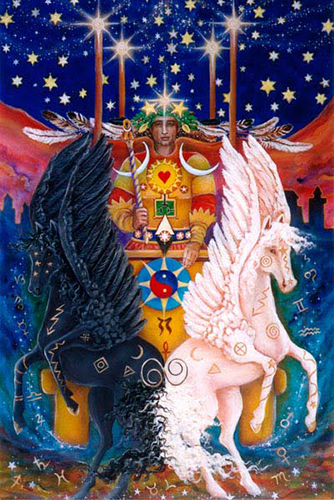 As with most versions of this card, the central figures are two rearing stallions and a Charioteer who is harnessing their divergent energies. But in this rendition the stallions are replaced by a white and black Pegasus, each pulling in different directions. If you look closely though, they do overlap in the middle, right below the ankh — or “key of life” — symbol. The black and white references — day and night, good and evil, positive and negative, conscious and unconscious, etc. serve as a reminder that we need to harness those divergent forces in order to achieve mastery. The Charioteer himself is clothed in ceremonial garb. Esoteric symbols — including the astrological glyphs associated with the zodiac and planets — are placed all around then, and are addressed in detail in the artist’s interpretation of this card. What stood out for me though was the effortless way in which the Charioteer takes command of these creatures, guiding them through a sort of constellational sea, far beyond the reaches of civilization. The union of consciousness (the cosmos) and intuition (the sea) is repeated in this card through all the symbolic references to the number Seven — which is the number assigned to the Chariot in most tarot decks. The seven visible planets are referenced here, as well as the seven chakras and the seven colors of the rainbow. Above the Charioteers head, and emanating from his crown are seven bright stars. Seven is a sacred number related to wisdom, intuition and spiritual initiation — among many other things. Like the Charioteer in this card, you can make great strides in your personal journey, as long as you’re aware of the need to focus your energy in one primary direction. You’ll have find a way to balance the diverging energies in your life. But if you can “pull it together” you can go along ways toward accomplishing your goals. The card used for today’s tarotscope — The Chariot — is part of the self-published Star Tarot series by Cathy McClelland. This is a 22-card Majors only deck which is sold out. However Cathy has signed with Schiffer Publishing and is in the process of completing the deck. She is working on the Minors at present. Check back with Cathy on her website to see the progress of this beautiful deck! Used by generous permission.